the Turks Express Utrecht cultural festival, 2006. 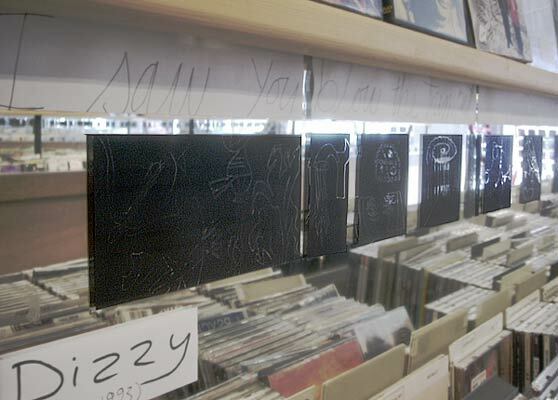 Detail of my drawings underneath a poem in the Plaatboef music shop, Leiden, 2005. 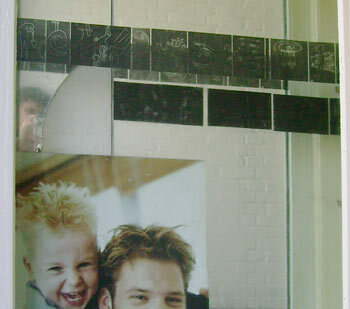 The Poetry on the Wall Foundation (www.muurgedichten.nl) coordinated the illustrations of 101 poems onto walls around the city of Leiden between 1992 and 2005. To finish the project they organized the Dicht op de Muur (Close to the Wall) festival where about 80 artists of Leiden exhibited an artwork in response to a chosen poem in a shop. 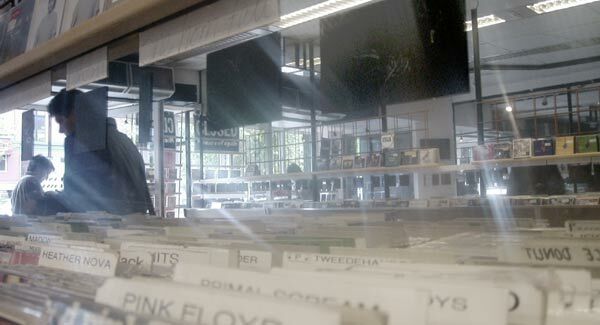 My poem was: Charlie Parker by the Harlem Renaissance poet, William Waring Cuney (1906 - 1976), at Langegracht 72, and my shop was the second-hand music shop, De Plaatboef, in the city centre (Nieuwe Rijn 42). My response to this poem was to write out the poem in one long line, and to place drawings underneath this. 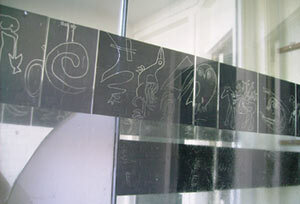 And I added another poem along the opposite mirrored wall, which you can see reflected in the mirror above. Dizzy by an Australian-Papua New Guinean friend June Perkins. So on entering people could walk along the left, reading the Charlie Parker poem and on leaving they could read the Dizzy poem along the right wall. 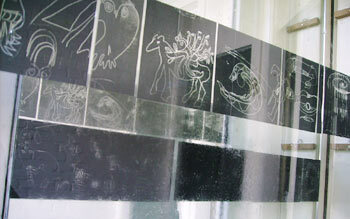 As you move the drawings, the transparent (mirrored) lines become more or less visible, creating a feeling of movement. The varied spacing of the images was intended to create a sense of rhyme and rhythm akin to music. 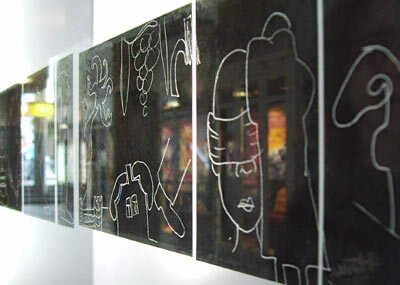 The drawings on transparent film on the mirrored walls, became more or less visible as you walked past. The images and broken images were intended to create their own voices or 'musics' in reaction to the words, sounds and rhythms in the poem, to jam along like one long score of music. Below: A bit of the Charlie Parker poem with the same drawings in a short animation. Click on 'refresh' or F5 to see the animation again. To come ... oneday..., an animation of some of the drawings with an excerpt from the Dizzy poem by June Perkins. in the Music Hall adjacement to the Utrecht Railway Station as part of the Turks Express Utrecht cultural festival. in a Moroccan Barber shop, Leiden. 2008 Threads of the Day Leids Wevershuis, Leiden Museum of Weaving, Leiden, The Netherlands. Land, 2001, drawing, collage / computer print. 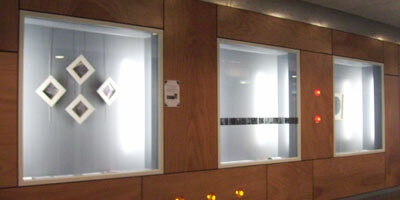 Te Wa... ( The Space, Place, Time...), 2001, computer print. 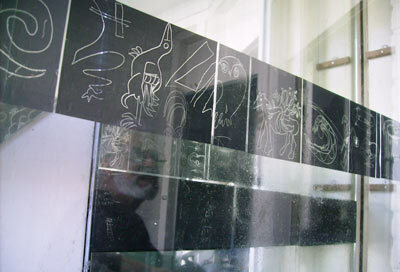 Apocalypse with four worlds, 1998, ink drawing. My soul, Myself, 1997, computer print, Edition of 20. Jonah's Whale, 1994, silkscreen on cloth. Letters of the Living, 1996, lithograph, Edition of 27.
Letters of the Living, 1996, batiked flags during the Oerol Festival. Pointer, 1995, painting on cloth. Essences and Particularities, 1994, 6 minute video. Prints and paintings, 1989 - 90.
prints and paintings, 1986 - 88. The New Vessels Series - How the mortals learn to pray, 1986 - 87.